Festive Collection 2013, The Time Place introduces a vast range of timepiece collections for your special moments with your closest relatives. This latest set is an amalgamation of tradition and modernity and elevated luxurious aesthetics for men and women. To commemorate the auspicious occasions of Idul Fitri, the collection is timed perfectly to suit the holiday ambience. Multiple selections of brands and products of elegant and refined timepieces are available at The Time Place boutiques near you. The collections could be perfect choices for an appreciation to your closest ones or to simply make a bold statement in your look at the special occasion. Read more about the festive collection 2012 below. Jakarta, 23 July 2013 – Celebrating the festive season, The Time Place introduces a vast range of timepiece collections for your special moments with your closest relatives. This latest set is an amalgamation of tradition and modernity and elevated luxurious aesthetics for men and women. To commemorate the auspicious occasions of Idul Fitri, the collection is timed perfectly to suit the holiday ambience. Multiple selections of brands and products of elegant and refined timepieces are available at The Time Place boutiques near you. The collections could be perfect choices for an appreciation to your closest ones or to simply make a bold statement in your look at the special occasion. With the festive season around the corner, The Time Place presents a sparkling collection of exceptional diamond studded complicated timepieces from Jaeger-LeCoultre, Girard-Perregaux, and Roger Dubuis. 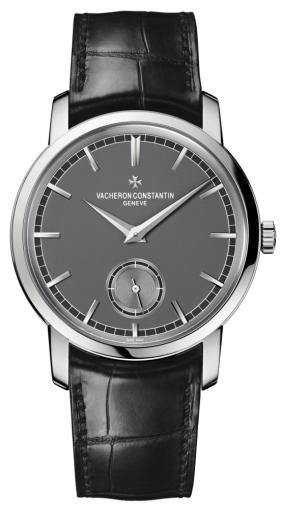 Vacheron Constantine creation offers immaculate designs while accentuating their classic features. 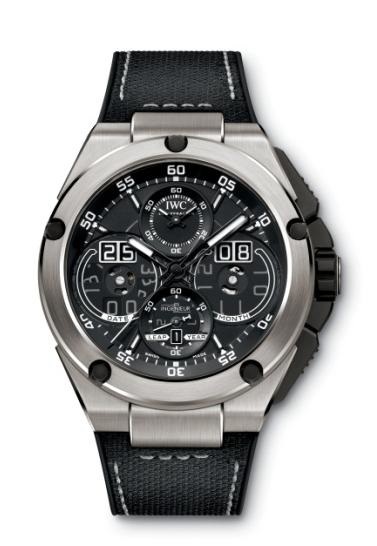 Chopard and IWC highlight daring sporty designs inspired by world’s most prestigious races. 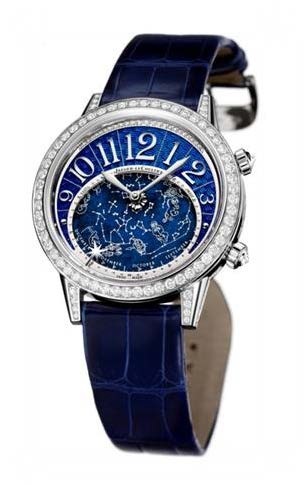 The new timepiece by Jaeger-LeCoultre has a rendezvous with the sky. Nestling in its 18-carat white gold case, the watch reveals the full force of charm by a ricochet effect. Like a luminous echo, diamonds dance across the sides of the case all the way to the crowns and the bezel, before unfurling like a diadem above the numerals. The dial succumbs to the beauty of rare crafts while preserving the impeccable readability of all the functions. The collection’s characteristic hour numerals feature a contemporary shape stretching across the curve of a crescent that is hand-guilloché according to the ancestral tradition of this decorative art and coated with a transparent blue lacquer. The hour arc tops a disc providing a spectacular vision of the sky with the constellation appearing on a precious lapis lazuli plate. Offering a delightfully lyrical touch, the designers of the model have chosen to incorporate a shooting star as a means of customising time: via a second crown adorned with an inverted diamond, the mobile star serves to set a personal rendezvous with the stars. Accentuating the celestial ambitions that make this watch a perfect instrument for making astronomical observations, a zodiac calendar on the dial serves to show the position of the constellations sat any moment of the year, by means of an annual calendar that governs the system of time display and measurement. The mechanical automatic movement, Jaeger-LeCoultre Calibre 809, rotates the star disc at the imperceptibly gradual pace of one turn every 23 hours, 56 minutes and 04 seconds. 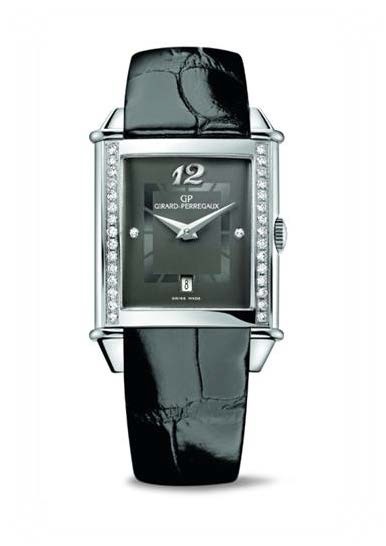 The new Vintage 1945 Lady from Girard-Perregaux confidently assumes the collection’s identity codes to reveal its feminine side. Dressed in steel delicately hemmed with two rows of diamonds, the watch harmonises the straight lines and curves inherited from the aesthetic of the early twentieth century. The spherical profile of the case here takes on a sensual allure. The hours spread out over a fine expressive canvas, while the watch curls ergonomically around the wrist. At 9 o’clock and 3 o’clock, two diamond hour markers balance the composition. The Vintage 1945 Lady comes in two dial versions – silvered or anthracite – and both are offered with black or white alligator strap. The manufacture calibre GP02700 reveals its flawless mechanism through the sapphire back, which was entirely designed in-house at the Manufacture. When aesthetics meets technique, time is fully appreciated. 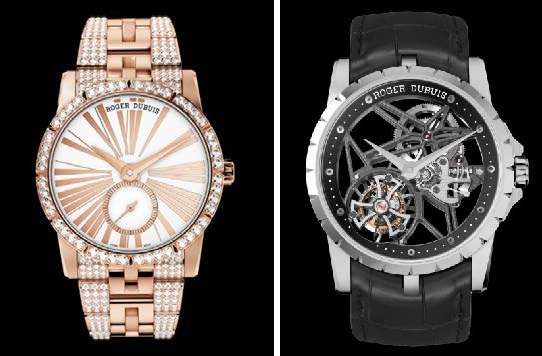 His lineage, chivalry and bravery make the most powerful Roger Dubuis creations. Two exceptional models in the Excalibur collection reflect his masterful, choreographed power in a perfect balance of technical expertise and artistic expression. One model in the Excalibur collection adds a precious touch to its daring designs. The Excalibur 36 in pink gold and set with a halo of 672 diamonds (approx 4.78 carats) sparkles with the light of a thousand fires, fitted with the latest generation of a Roger Dubuis mechanical movement with automatic winding: the calibre RD821. Composed of 172 parts, it can draw on a power reserve of 48 hours. The Excalibur 36 has received the highest recognition in the world of Fine Jewellery: it is certified by the Official Swiss Chronometer Testing Institute (COSC), and is stamped with the prestigious Hallmark of Geneva. An object of indisputable technical excellence that is also an exceptional piece of jewellery, the Excalibur 36 is facing a stellar future. Elegance is also the main aspect of the other collection in Excalibur collection, Excalibur 42 Chronograph. Its firmly masculine, sporting appeal is reinforced by a straight-line design. Readability is the primary requirement for its functions. Other features are based on technology. The Excalibur 42 Chronograph conceals treasures of ingenuity in its mechanisms. Its elegant steel case houses the new RD681 automatic chronograph movement with a micro-rotor. Designed, developed and produced in the Roger Dubuis Manufacture, this calibre of 280 components combines aesthetic quality with performance. Employing the most advanced production techniques, it meets all the requirements of Fine Watchmaking: it is certified by COSC, the Official Swiss Chronometer Testing Institute, and is stamped with the prestigious Hallmark of Geneva. Focuses entirely on its new partnership with the MERCEDES AMG PETRONAS Formula One™ Team, the 2013 Ingenieur watch collection has been completely overhauled and comes to the grid with a host of new features. Pole position has to go to the spectacular Ingenieur Constant-Force Tourbillon (Ref. 5900) in its platinum and ceramic case. Materials typically used in motorsport, such as carbon fibre, ceramic and titanium, are the hallmarks of a new design line in the Ingenieur watch family. Its patented constant-force mechanism is integrated into the tourbillon and guarantees an extremely precise rate. Two barrels supply the higher torque required to drive the constant-force tourbillon and also supply the energy needed for the moon phase module. Another model guaranteed a place at the front of the grid is the Ingenieur Perpetual Calendar Digital Date-Month with its case made of titanium aluminide, perpetual calendar and digital date display. In order to maximize efficiency, it emulates the hybrid boost button used in Formula One™ and uses the energy recovery principle. Every night, when the date display advances, the quick-action switch taps off a little energy and stores it until the end of the month or year and makes it available precisely when it is needed. The dial has semi-transparent sapphire-glass inlays over the date, month and leaps year discs, which enable the wearer to observe the complex interplay of the discs as they advance. On New Year’s Eve, the five displays begin to move simultaneously. It is a complex technological feat that will hold an irresistible appeal for lovers of sophisticated mechanical systems. This new timepiece meets the requirements of the Poinçon de Genève or Hallmark of Geneva, which are no longer confined to the movement alone, but now also take account of the finished watch. The 950 platinum case frames a slate grey dial displaying the perpetual cycle of time. Long applied 18-carat white gold hour-markers, punctuated by a painted white minute circle standing out against a black background, create a pleasingly rhythmical visual effect. The quest for simplicity is reflected in the elegantly traditional sweep of the hands and expressed through refined execution imbued with a timeless, eminently horological spirit. Throbbing at the heart of the case is the hand-wound Vacheron Constantin 4400 movement. Developed and crafted in harmony with the most demanding standards of the Geneva Fine Watchmaking traditions, it beats at a rate of 4 Hz (28,800 vibrations/hour) and displays the hours, minutes and small seconds at 6 o’clock. It has an approximately 65-hour power reserve. Both its finishing and its conception testify to superlative craftsmanship. Not only are the main flat surfaces of the movement adorned with a meticulous “Côtes de Genève” motif, but their angles are also bevelled and hand-polished, as are the screw heads. Setting the finishing touch to this model, Vacheron Constantin has fitted its new Patrimony Traditionnelle small seconds with a black Mississipiensis alligator leather strap fastened by a 950 platinum pin buckle. 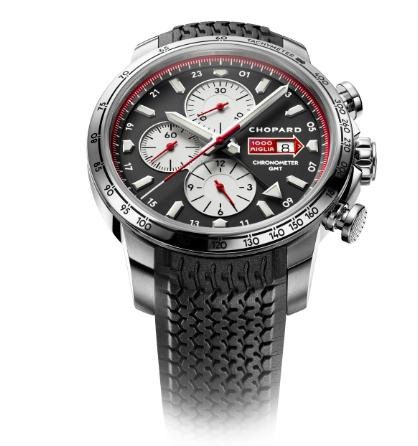 For the past 25 years, Chopard has faithfully partnered the Mille Miglia race. This constancy testifies to the close ties between the Geneva-based House and the world of motorsports. The entirely redesigned GMT chronograph celebrating the 2013 edition of “la corsa più belle del mondo” is a nod to the design of historical racing cars. Ergonomic, functional and sophisticated, the Mille Miglia 2013 is a limited edition that has racing in its genes and in its gear trains. In terms of substance, this Mille Miglia 2013 is a self-winding chronograph featuring a 24-hour dual-time indication and a date display. The dial of the Mille Miglia 2013 chronograph focuses on readability. Another distinctive feature is the date that is now shown in the red arrow that has become the race logo. This shape is also echoed on the hour-markers, which, along with the hands are enhanced with Superluminova to ensure the watch can be read at night inside a classic Maserati or Porsche. The colour symbolising Italy’s passion for automobiles is the chromatic theme of the Mille Miglia 2013 chronograph. This vibrant red shade frames the inner bezel ring, surrounds the counters and adorns the chronograph hands. Time International is the holder of exclusive retailing rights or authorised sales points to over 40 of the most well-known brands in the world of timepiece and lifestyle products. The company has been a pioneer in the industry since the mid-eighties. Time International has the largest service centre in Jakarta with its state-of-the-art service centre provides provisional after-sales care for all brands sold from the retail outlet. All technicians are trained by the international brands and have the most up-to-date product knowledge. The service centre is committed to product integrity, customer care and quality assurance. 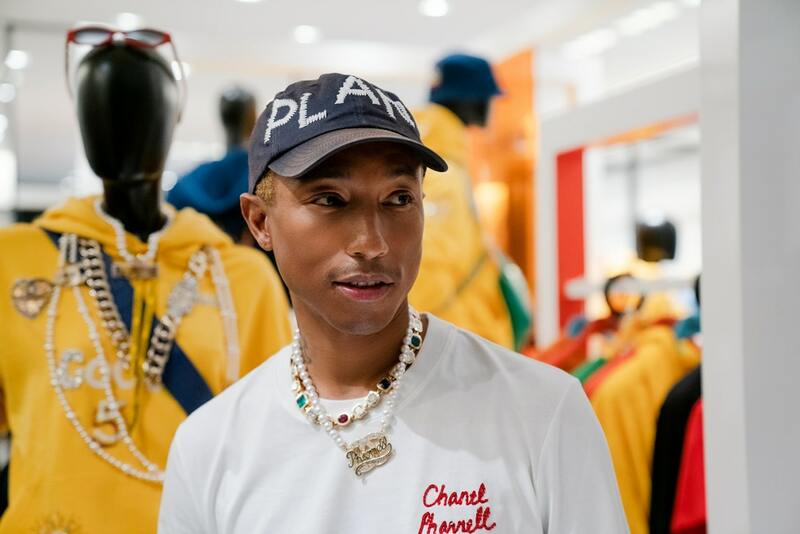 Other retail businesses within the Time International group are The Time Place, INTime, Cartier, TAG Heuer Boutiques, Chanel, and Fendi boutiques.